Hi! In this article I want to share with you, how I use Pinterest and why I find it to be a very useful tool. First of all, this is not about using Pinterest for Social Media Marketing, it’s about taking advantage of Pinterest’s functionality for your own business workflow. I consider this to be of interest for anyone who wants to communicate ideas in an efficient, less time consuming way. Especially if you communicate online and want your material to be accessible form anywhere. Plus it’s super easy to use, to collaborate and it’s for free. Usually I use Pinterest at the start of a project to collect ideas, check out different styles, seek for inspiration, check out the competition and so on. Why is research so important? Well, if you don’t do it, you haven’t done your homework. First, because you need to know what is out there and second be able to analyze it. What seems to be working good? And what is crap? Doesn’t matter what business you are in, research is always the one right thing to do in order to find a good solution. Let’s say I am developing a new website and I’m in the stage of defining the style. 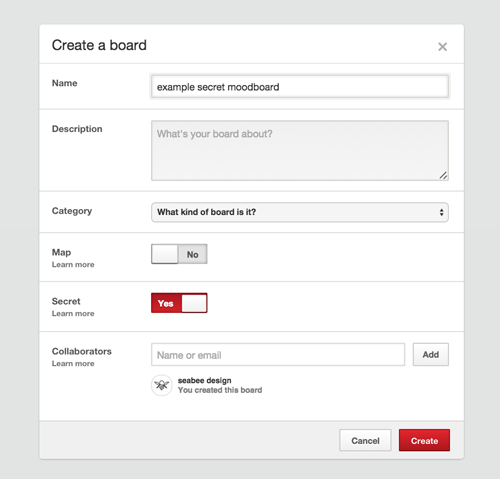 My first step is to create a secret board, which is not open to the public. You can do this by creating a new board and switching on the secret mode (marked red in the screenshot). If I want to share my board with a co-worker or a client I use the field below saying “Collaborators”, type in the e-mail or Pinterest name and evoilà, we are ready to receive some feedback and exchange opinions. Of course you can invite people to the board also later on, you’ll find this icon in your board, above the pins. A moodboard is a tool that helps you communicate an idea, describe a mood or a certain style of a project to your client. Most importantly is that it helps you come to an agreement about the project. There are no rules of how to create a moodboard or how it has to look, it comes in many forms and also different names, depending on the industry. Additionally all different kinds of footage can be used for it as well, it does not even have to be digital. Anyways, I think Pinterest boards make really good moodboards. You can easily put together different visual footage in order to create your own moodboard and also easily share it with your client. Who then can provide feedback or even highlight certain pins by liking or commenting them, or even create a new modified moodboard with the chosen pins. The pins used might be your own or any other image on the www. For adding any image to your moodboard just download the pin-it button, which is a browser add on. Every time your cursor is on an image the pin-it button will appear. 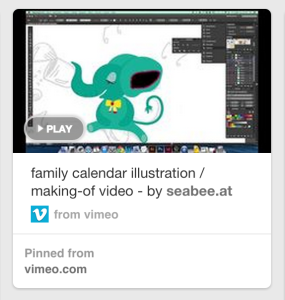 Another great feature is that you can also pin videos, I pinned for example a video of how I illustrated something for my family calendar. How can Pinterest be educational? Quite easily actually. Especially because you can not only pin images, but also videos and articles. I think it could be a very good platform for students and teachers to work together, but also for companies and their employees. Pinterest seems to offer the right infrastructure to share educational material in a structured and easily accessible way. This is a good way of finding out what your websites visitors find visually interesting. I hope you found this information useful. If you want to share your own experience, give feedback or if you have questions feel free to share/ask.